Separate the leaves of both chicory heads and discard the cores. Place the leaves in a bowl with the spinach or watercress. Halve and core the apple, then cut into wedges about ½ cm thick and sprinkle with the lemon juice to stop them going brown. Make the dressing by whisking all the ingredients together. Add seasoning, to taste. Cut the bread into 12 slices about ¾ cm thick and lightly toast on both sides. Cut the Fontina into slices ½ cm thick, to fit each of the bread slices. Top the bread with the cheese. Place on a baking sheet or piece of foil under a hot grill and cook until the cheese begins to melt. 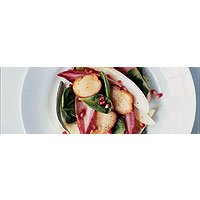 Quickly toss the salad leaves with the apple slices (leaving the lemon juice behind) and two-thirds of the dressing, and divide between 4 plates. Scatter the pomegranate seeds over the top. Place 3 cheese croutes on each salad and drizzle the remaining dressing over them. Serve immediately.